Scheveningen (@Sport1Open) Mid-Week Report; Golubev/Nedovyesov Match Fixing? My day started off with a first round match between Tim ‘Golden Set’ Puetz and second seed Daniel Munoz-De La Nava on Court 1. 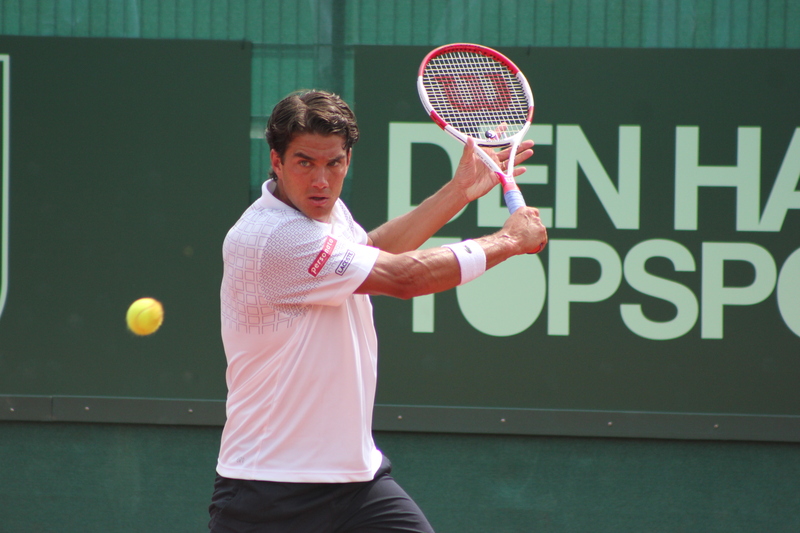 33-year-old Munoz-De La Nava is playing the tennis of his life and might be entering the top 100 for the first time soon. He had a rocky start against the German, dropping the first set 6-4. But after a very long game in the second set, lasting about fifteen minutes, he broke through Puetz’s serve and started cruising from that point on. 4-6 6-3 6-1 was the final score. Puetz shouts "Scheisse" after shanking a ball out of the park and drops serve in the next point after what must have been a 15-minute game. Amazing scenes. A Puetz serve bounces off the fence and hits the glasses of a linesman off his head. Played at the same time was a match between Jordi Samper-Montana and Mathias Bourgue, who landed in a third set after a remarkable scoreline, with Bourgue handing out a bagel in the first set and Samper-Montana replying with a breadstick in the second. The third set was very heated, with both players regularly cursing and shouting at the top of their lungs after losing long points. In the end Samper-Montana prevailed, 0-6 6-1 6-4. He faced Munoz-De La Nava a day later in the second round and wasn’t able to take a set, although he kept it close with 6-4 6-4. I didn’t catch Jesse Huta Galung’s 6-3 6-3 defeat against Andrey Kuznetsov, but after the match I overheard him saying that he hurt his wrist during the Davis Cup weekend and will visit a hospital soon to have it checked out. It didn’t prevent him from winning his doubles match later that day, so hopefully it isn’t a serious problem. Over on the non-streamed Court 8m Andrej Martin faced Jan Mertl and wasn’t troubled. Spurred on by his girlfriend, they were both constantly saying ‘Pome, Pome, Pome’ as a sort of mantra. He won the match 6-4 6-2. It was an amazing coincidence for Andrey Golubev and Aleksandr Nedovyesov having to face each other in the first round after just having spent a Davis Cup weekend together in Australia. I took the picture for that reason, unaware that they might have been planning a fix right under my nose. I could have taken an educated guess, however, since their previous match followed exactly the same pattern. 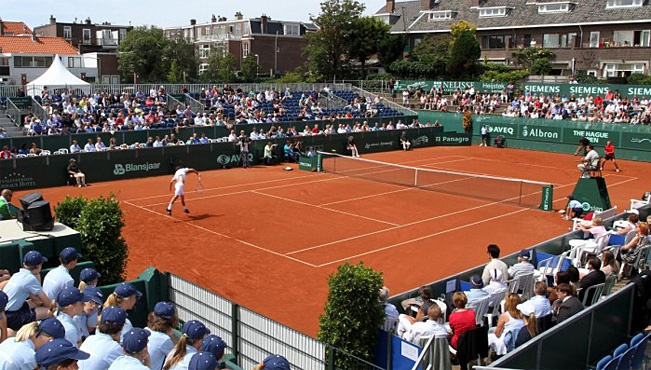 Here in Scheveningen, only the winner was different with Nedovyesov winning 2-6 7-6(2) 6-2. The fix was clear as day, with Nedovyesov’s odds starting to drop in the middle of the second set already, while there were no signs of an injury for Golubev. On the contrary, Golubev only dropped one point on his serve until the tiebreak, when he suddenly dropped three. Before the match their odds indicated a 50/50 match, but in the middle of the second set Nedovyesov started to become the favorite, despite being a set down. A mini-break up in the tiebreak saw him become a 80% favorite, while something in the neighborhood of 40% would have been appropriate. The match has been reported to the Tennis Integrity Unit for irregular betting patterns, but I’m afraid nothing will happen, like we have seen so many times in the past. Better money distribution is needed to fight match-fixing. A R1 Umag loser receives more than ten times that of a R1 loser in Scheveningen.
.@JTSports27 There is less incentive if you can make a living out of tennis instead of losing money like most Challenger players do now. The match I was looking forward to the most was that of Nikoloz Basilashvili against Philipp Davydenko, Nikolay’s nephew. Basilashvili is a big talent and his groundstroke power and natural shot-making ability will often leave you in awe. His biggest problem at the moment is that his game is way too low percentage, giving him nothing to fall back on when his game isn’t clicking. Clay is also his worst surface and it showed against Davydenko, the world #575. Davydenko wasn’t doing a lot, mainly putting the ball back into play half-court, together with some fine singlehanded backhand winners, with which he can generate some great power from time to time. But it was enough to take the first set from the world #120, 6-4. He was supported by his girlfriend, who even changed sides with him. It was clear however that as soon as Basilashvili would find some rhythm and cut the wild unforced errors out of his game he would be able to turn the match around, which was exactly what happened. Basilashvili grinded out the win in the end, 4-6 6-3 6-3. Over on Court 1, the highest quality match of the day was played between third seed Jan-Lennard Struff and Adam Pavlasek. Struff came out incredibly strong, dominating his opponent and making it hard to believe there would be a possibility of him losing the match. Pavlasek fought himself into the match, however, and won the very high-quality affair, 3-6 6-3 6-4. On Centre Court the Dutch players did well, with Thiemo de Bakker beating eighth seed Norbert Gombos 6-4 6-2 and top seed Robin Haase beating Aslan Karatsev, although Haase had considerably more troubles in his 7-5 5-7 6-4 victory. Thomas Schoorel didn’t manage to upset Adrian Ungur, despite having a set point in the first set, with the Romanian winning 7-6(6) 6-3. All in all a great day of tennis and there is plenty still to come, with especially the second round encounter between Basilashvili and Florian Mayer being a mouth-watering prospect. Posted in: ATP. Tagged: 2014, atp, challenger, david goffin, Den Haag, Jesse Huta Galung, Netherlands, recap, Scheveningen, Sport1 Open. Quarterfinal Friday in Scheveningen wasn’t a good day for people hoping to see tough battles and long matches, with all winners coming through after routine victories. The day started with seventh seed Andreas Beck taking on Matteo Viola. The crafty Italian is a pleasure to watch because of his intelligent game and well-timed dropshots, but Beck never seemed like losing the match as he went through to the semi-final with a 6-4 6-4 victory. Nevertheless, this turned out to be the most hard-fought match of the day, as the other matches were even less close. Dutch hope Jesse Huta Galung took on his doubles partner for the week, Martin Fischer. Huta Galung quickly got on top of the match, as he dominated Fischer and never gave him time to get into the match. Fischer helped him out at the important moments of the match, as he racked up a lot of errors, prompting the normally so gentle Austrian to even angrily throw his racquet on the ground at one point. Highlight of the match was the game Huta Galung took down at 4-1 in the first set, as he needed more than ten deuces to finally do so, with the game lasting almost twenty minutes. Huta Galung kept his run and the hope of defending his title alive, 6-1 6-4. Up next was David Goffin, who took on Aleksandr Nedovyesov. Goffin has looked like the best player of the tournament all week long and again easily disposed of his opponent, 6-4 6-2. Nedovyesov played an interesting style of wild ball-bashing and drop-shotting, which didn’t work out as he was wildly impatient, feeding his unforced error count to worrying heights. He seemed displeased by his performance as well, constantly talking to himself, smashing his racquet and getting angry with the crowd. The day ended with Souza taking out Zeballos 6-3 6-3, as the latter clearly had not recovered from his previous matches. In my earlier report, I posted a video of the state he was in after ousting Schwartzman in the previous round, which didn’t bode too well for the remainder of his stay at the tournament. This turned out to be correct, as he was just a step too slow at all times and clearly has some fitness work to do if he wants to return to old form. The semi-final line-up must have been a dream for the organization, as it included a Dutchman, two players from neighboring countries who were formerly in the top 50 and one interesting exotic player from Brazil. 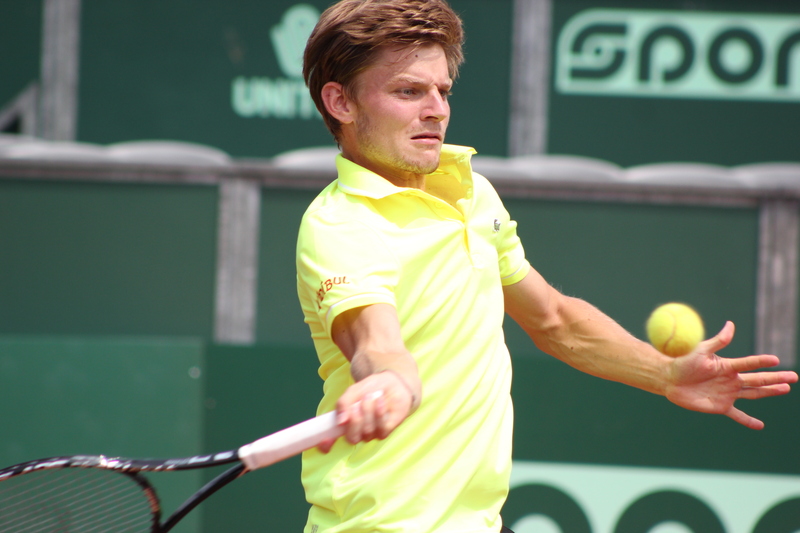 As the day started it looked like it was heading towards the same lopsidedness as the previous day, as Goffin absolutely hammered Huta Galung 6-0 6-1. Goffin played a perfect match, but Huta Galung didn’t seem as explosive as usual and it’s probable that he was feeling the effects of a leg injury he attracted earlier this week, as evidenced by the protective tape he was wearing. A point early in the second set summarized the match, as Huta Galung managed to hit an easy smash in such a manner that it bounced on his side of the court first. The second semi-final between Beck and Souza seemed to follow a similar pattern as Beck went down 2-6 *0-2, but he regained composure, started to find his range and fought back to turn around the match and notch up a 2-6 6-3 6-4 victory. Goffin was heading into the final as a clear favorite and he didn’t disappoint. Beck was simply outclassed as the Belgian easily took him down in straight sets, 6-3 6-2. An impressive run by Goffin, not dropping a single set, and an important one, as this result puts him back into the top 100 at the 85th spot, a rise of 21 places. Beck made a jump as well, gaining ground on a top 100 spot with a rise of thirteen spots to the 118th ranking position. All in all, and despite the lack of epic matches in the final stages, this has been a great tournament with a well deserved winner in David Goffin. Until next year!